During the height of the ‘Railway Mania’ of the 1840’s, the York and North Midland Railway was building its line from York to Beverley, where it could then travel on to Hull. It had reached as far as Market Weighton by 1847 but there it stopped until the North Eastern railway completed the connection in 1865. Had the Y&NMR continued on, it may also have built a connecting branch from this line, running through Etton, in order to reach Bridlington. 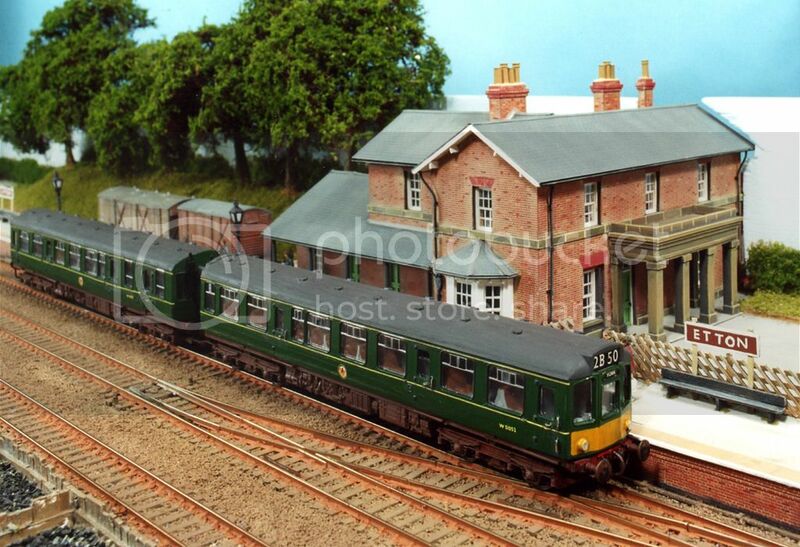 My original layout creation ‘Etton’ was built in the loft of my house as a simple modelling exercise. Having visited model railway shows previously I thought I might like to have a go trying to create something. Etton is a village in East Yorkshire a few miles away from where I currently live. There was a railway about a mile away that passed by, and although long since gone, evidence can still be found of its existence. There was certainly no railway station at Etton. Etton village is full of traditional East Yorkshire architecture, classic, tumbling gables, red pantiles, grey slate, bright red mixed brickwork, a joy to model. The layout includes a station as it might have appeared in the 1960’s, with local traffic and occasional excursion trains based on video and written evidence from the period and location. Trackwork is Peco Code 100. The model was later extended to include a village scene in front of a second fiddle yard. All model buildings were based on surviving buildings along the York to Beverley line including Etton village itself. Etton layout was eventually sold after attending 45 shows in 2006. I have since tracked it through 2 or 3 owners and it may currently reside in Lincolnshire. The station buildings were laid loose and some were lost during exchange of owners as I understand it. I believe they may have been replaced. The village should still be intact as the photographs show. Having an interest in model railways, military vehicles and architectural modelling, the combined conclusion evolved into a depiction of a typical country village located towards the south coast of England at a time when the tide of the second world war was beginning to turn. Based on the time of at or about ‘D-Day’ the layout in includes lots of military detail as well as historically researched train combinations. 1944 heralded the start of a new phase of the second world war. Allied armies would be launched onto the western side of Europe in June following a 3 month period of concentration of arms, armour and manpower in the south of England. Troops and equipment were massed at camps within a 10 mile radius of the ports of Portsmouth and Southampton. De-training railway stations were chosen, each serving large camps hidden in forests. Rowland's Castle on the Hampshire / West Sussex county border was one such de-training station. It lies on the 'Portsmouth Direct' main line from London Waterloo to Portsmouth and Portsmouth Harbour. The model railway depicts the country station as it may have appeared in 1944 using visual reference from 1930's pictures and maps. The curve through the station is mirrored to real life and continues on an embankment as it passes the village green. Some of the major village buildings are represented including 3 pubs and a chapel. This part of Hampshire is heavily wooded and the large forestry areas surrounding the area were ideal to hide the troops and military equipment. I have shown just one corner of just such a forest showing tents and troops at rest within a forest of fir trees. Train compositions are based on historical research and ‘first hand’ accounts obtained. They include government pooled goods and troop trains together with EMU services. Trackwork is SMP Code 75 and the layout is built to finescale standards. 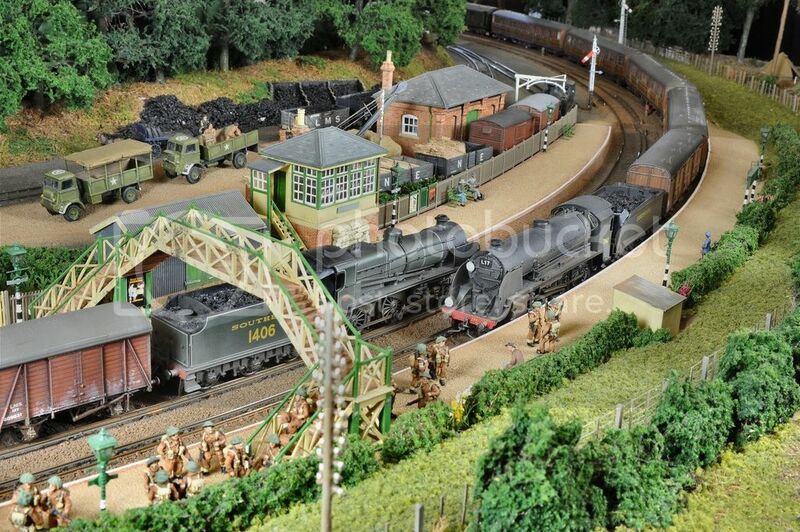 The Rowlands Castle layout attended more than 55 shows since its first appearance at the Hull show in November 2008. We have been all over the country and also onto mainland Europe. The layout has now retired from the exhibition circuit and has been sold to The Rowlands Castle Heritage Centre and lives at Stanstead House in Rowlands Castle where it can be seen on public display and operated during the summer months. 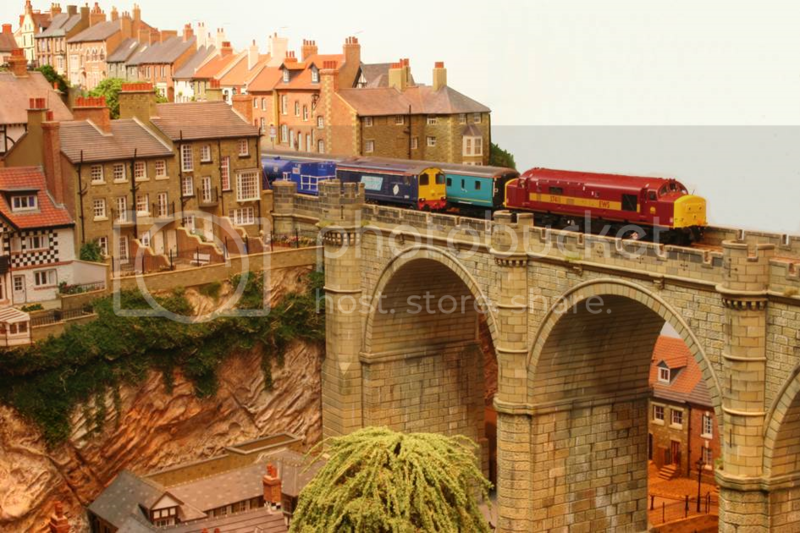 A modern image model railway based on Knaresborough. Intrigue, folklore and architecture. This layout combines the experiences gained on the Etton and Rowland’s Castle layouts. Its prime aim is to purely entertain. The layout is based on the North Yorkshire market town of Knaresborough. Set in the time period around 2005-2015, running stock includes the modern day colourfully liveried DMU’s and several long special trains including the Northern Belle Pullman, Scarborough Spa Express and the Tour De France. Whilst it has a ‘modern image’ leaning, it has only a simple branch line theme with trains running through the station on a twin track continuous circuit run. The market town setting contains a very strong historical theme to continue the military overtone created on previous layouts. A bold proposal, but the finished effect hopefully captures a charming contrast between a bustling market town and wooded countryside horizontally, and a sheer cliff face and river gorge vertically. This is a pilgrimage into model building construction that produced double the structures that appeared on the Rowland’s Castle layout. From Knaresborough Castle the Kings Tower and Courthouse structures are modelled, together with an array of architecturally interesting buildings taken from High Street and Market Place in the town centre together with parts of Finkle Street, Kirkgate, Waterside, Riverside and Water Bag Bank. The station and town scene to the left of the layout contrast with the deep River Nidd gorge with its sheer cliff faces in the centre, and Mother Shipton’s wooded countryside and the castle grounds on the right. ‘The Worlds End’ refers to the pub that features at the front of this modern image layout, which in turn is derived from the legend of Mother Shipton's prophecies. 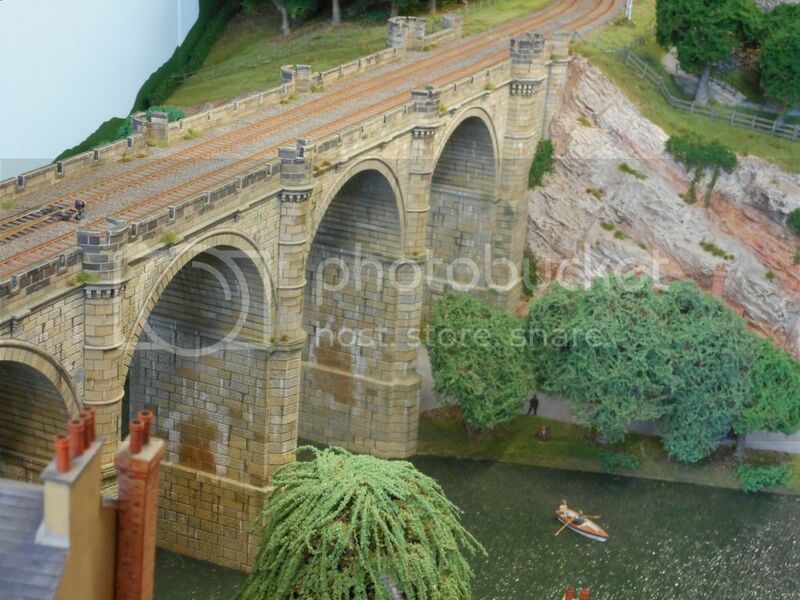 Also featured is the large stone built and ornate viaduct over the River Nidd which at 4mm to the foot scale is around 5 feet long and 14” high.